1 of 3 Whisk together lemon juice, olive oil, 1/2 teaspoon of the salt and the pepper. Pour half the dressing into a large resealable plastic bag. Add chicken to bag and coat well. Marinate in refrigerator for 30 minutes. 2 of 3 Meanwhile, heat grill to medium-high. Using a vegetable peeler, remove large, lengthwise strips from yellow squash and zucchini. Toss with remaining dressing, the almonds, cheese and basil, and remaining 1/4 teaspoon salt. 3 of 3 Remove chicken from marinade and grill 4 minutes per side, or until internal temperature reaches 165 degrees F on an instant-read thermometer. 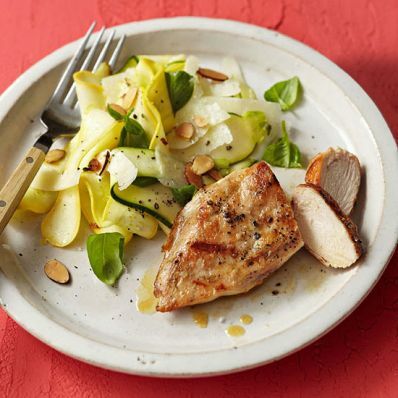 Serve chicken over squash salad.